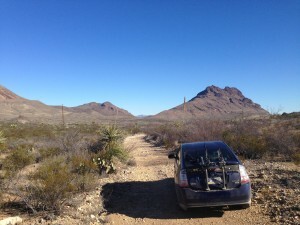 It didn’t take long for me to get in some trouble out here in the Chihuahuan Desert. As usual, I did it to myself. 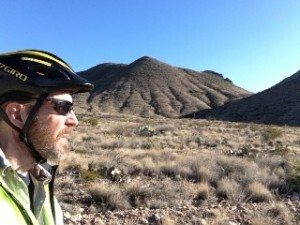 On Friday evening when the local folk were driving into the towns of Study Butte or Alpine in their F-150s, I was mountain biking up over the Christmas Mountains. 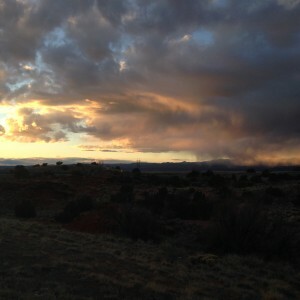 The day before, my host Lori had pointed at the dirt road angling up the west slope like a rattlesnake. “Lake Ament Road goes about eight miles,” she said, “up and over the mountain then back down to 118.” Texas 118 is the only paved highway around here, running between Study Butte and Alpine. I had been on 118 a few times, and eight unexplored mountain miles sounded like some good afternoon exercise. I planned to ride to the top of the pass, look around, turn back -?- and likely be home around 5p, plenty of light left. So I set off at 3pm in broad daylight, a pleasant seventy degrees, no wind. I brought two full water bottles with electrolytes, an apple, a couple Gu servings (high-energy sports nutrition gels), my headlamp, wool shirt, windbreaker and a compass just in case I got stuck after dark. Which all felt pretty unnecessary, like bringing a life jacket to a wading pool. After the first mile of washboard gravel the road angled up steeply and became increasingly difficult. I have a thirty-speed mountain bike, 3 up front and 10 in the rear, which means I can basically climb up a brick wall in normal conditions, albeit slowly. But instead of solid pavement or dirt I was on scree, the loose stones that cover mountain slopes, spinning my rear wheel at times and trying to keep the front wheel on the ground. Deep washout ruts undercut the road and at times I had to dismount and push the bike up, scrambling to keep my footing. It was getting harder to catch my breath as well: my trailer sits above five thousand feet, which is nothing for the locals but my Indiana lungs were still getting used to the altitude. And I was still climbing. Soon I wasn’t even sure I was on the right road, as graded cuts constantly split off to the left and right: remote access roads and flood spillways carved off into the brush. As my route got narrower these cuts became indistinguishable from the main road. Last year the local Fire Chief told me that even his EMS crews didn’t know where many of their citizens were located: some had no addresses whatsoever. But I kept to the routes that seemed to be going up, and it worked. Eventually I reached the mountain pass, a gorgeous view to the west and ridge upon ridge of rugged mountains extending to the horizon. The sun was getting low. Decision point. I had to keep moving, but didn’t want to return down the ridiculous maze I had ridden up, in case I got lost and stuck in the dark. I still had half my water and figured I could continue forward, drop into the valley, get on 118 and bike the longer but easier (and familiar) route back around the mountain instead of over it. I couldn’t actually see 118, just few small ranch buildings on hillsides. So I pulled out my binoculars and scanned the darkening landscape. A speck of a car crossed a low gap between two mountains far to the west, fast enough to indicate a highway. That had to be 118. And then I heard voices. I turned and saw two 2-seater ATVs parked just fifty yards away on the same overlook. I hadn’t even heard their approach. I walked over and said hello to one driver, a man with a big gut, a Budweiser in his left hand and a blank-faced woman seated on his right. Another couple sat in the other ATV. “Is that 118 down there?” I asked. The Bud man seemed a little unfocused. “I’m pretty sure, yeah,” he said. “Does this road connect down there, to 118?” I asked. He laughed. “I think so, yeah.” Another speck of a car crossed the gap in the distance and I had what I needed. “I knew a guy once rode a hunnert miles in one day on a bike!” the Bud man called after me. “He was all skinny like you!” The men laughed, the women did not. The ride down the west side of the mountain was a blast. It reminded me of my amateur downhill skiing days, but on rocks and sand, just in “control” enough to avoid a crash. Wahoo! I was at the bottom of the mountain in ten minutes. Texas 118 is a chip-seal road, the pavement constructed by spraying compacted gravel with liquid asphalt. Its the bane of road bicyclists, a rough and annoying ride that’s hard on tires. But after Lake Ament Road it felt like riding on glass, so I commenced the long route home with a smile, spinning up the winding climb to the north, all alone. A pickup would roar by every fifteen minutes or so. What I hadn’t noticed in the car before was that the entire forty-five minute drive back to my trailer was one long, steady uphill climb. Gradual incline is one of those things you’re oblivious to when driving a car, like the wind speed, wind direction, outside temperatures, aromas, or the effort it takes to start moving a body (and bike) from a dead stop at a red light. I had just ridden an hour and a half up a steep mountain, coasted downhill for ten minutes, and was now facing a twenty-three mile ride back up. The sun was kissing the horizon now and the temperature was dropping, fast. As long as I was pedaling I’d be warm. But to pedal, I needed fuel. So I pulled off the road, ate my apple, squeezed a Gu nutrition packet into my mouth, and swigged water from my second bottle. Then I pedaled. And pedaled. The stars came out, but no moon. Every half hour or so a pickup truck roared past. At 8pm I reached the turnoff onto Lake Ament Road in total darkness, the same road I had started up into the Christmas Mountains that afternoon, but further up. I was just two and a half miles from my trailer located somewhere out there in the dark. I could make out the familiar black silhouette of the Christmas Mountains on my left, and the Corazon Mountains on my right. But I was now groping through a sand and gravel rat maze with the small beam of my headlamp. My compass was useless without a map and enough daylight to see landmarks. I was navigating more by feel and spatial reckoning than by intellect, analysis or even eyesight. It reminded me of walking the “path of the heart”, the shamanic wayfinding practices I have studied since 2009, and now teach to others. I kept climbing. A vehicle had been following me slowly, and crept up behind me now. With my hi-viz safety vest, red taillight blinkers, handlebar light and headlamp I was a real clown-show for the locals. I pulled over and motioned the truck to pass, but it stopped next to me in a cloud of road dust. “You live around here?” said an unpleasant woman’s voice. “Yes,” I said, pointing up into the dark. “I’m renting the Lil’ Hobo trailer up there.” There was a pause. I saw two big dogs glaring at me from inside the cab. “Oh, Lori’s place,” she said. “Okay then. Be careful!” She pulled ahead and I watched her taillights climb and fall until they were gone. When I looked back up at the mountain horizon, something was wrong. 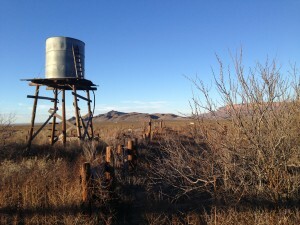 Both the Christmas and Corazon mountains were now on my left. My trailer was between them, on Christmas mountain: the Corazons should be on my right side. Crap. I was off my route, riding on empty, around the north side of the wrong mountain! The temperature had dropped into the fifties, and a headwind was picking up. Lori had told me that if I ever got lost in all the turnoffs near her place, “just follow the electric lines.” This had struck my urban sensibilities as funny, but out here I understood: there was only one electric line, a single-wire affair that ran up the middle of the gap between the two mountains I was approaching, roughly in line with Lake Ament Road and no other roads. I swung my headlamp in a full circle around me, but no electric poles. Crap. I turned around, and rode back down the road a while to find where it merged into another road. Hopefully, that would be where I had gotten off track. I found the intersection, stopped, and swung my headlamp around again. This time I saw the dim reflection of an electric pole out in the darkness. Relief. I got back onto Lake Ament Road, and continued climbing through the rocks, washouts, dips and turns. I was now exhausted, hungry and thirsty, but I was back in my driveway now, even if it was a two-and-a-half-mile-long driveway. I finally reached the entrance to my trailer’s short access road, which Lori had marked with a little string of solar-powered Christmas lights slung over a boulder. Home Sweet Home. Yes, I learned my lessons. Like never underestimate a mountain, temperatures drop fast in the desert, and always count your Gu packets. At the same time, I was reminded of a positive lesson. Like the fact that you can go a long way in complete darkness, if you have a little sense of direction, follow your power lines, and someone out there has left the Christmas lights on for you. I can’t wait to go out again. 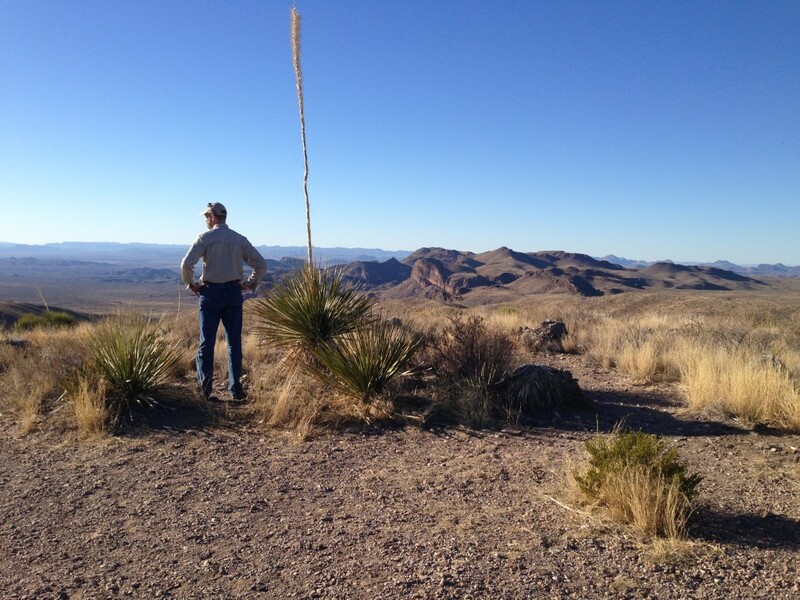 Posted on January 31, 2016 January 31, 2016 Categories Terlingua Desert Log2 Comments on Terlingua Desert Log #2. How to Navigate in the Dark by Power Lines.